Combine a few simple ingredients for a speedy shortcut to the dinner table. Combine 1/4 cup rice, 1 Tbsp. dressing and 1/2 tsp. soy sauce in each of 4 microwaveable soup bowls. Add 1/2 cup of each of the remaining ingredients to ingredients in each bowl; stir. Cover with waxed paper. Microwave on HIGH 3 to 5 min. or until soup is heated through; stir. Let stand 5 min before serving. 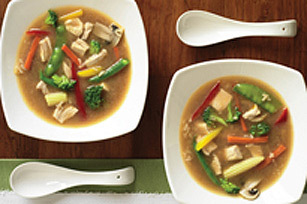 Carefully remove the hot filled soup bowls from the microwave since the soup and bowls will be hot. Don't skip the veggies. They make this satisfying hot soup and excellent source of vitamin A.